Howlin' Wolf Records: SIX STRINGS: THE LAST STAND....A very violent car commercial? What a great time it is to be an action movie fan. It is also kind of a weird time as well. Who would have ever imagined that Arnold Schwarzenegger's return to the big screen in a staring role would be a modern day western directed by one of the greatest directors to come out of Korea, Kim Jee-Woon. If you haven't seen THE GOOD, THE BAD AND THE WEIRD, I SAW THE DEVIL or A TALE OF TWO SISTERS then you are missing out. The action movie hero torch was never successfully passed to a new generation. I know we saw an attempt with the Rock in THE RUNDOWN but he kind of fumbled it with crap like DOOM and (sigh) THE TOOTH FAIRY along with even more forgettable crap. FASTER was his best but it's too little too late. Thankfully Scott Adkins was there to catch the fumble and with the help of director Isaac Florentine was able to bring about a direct-to-video resurgence of truly great action films like NINJA and UNDISPUTED 2 and 3. But it looks like 2013 is the return of the old guys. We have THE LAST STAND with Arnold, followed by BULLET TO THE HEAD with Stallone and finally DIE HARD part 5 with the ever charming Bruce 'freakin' Willis. All three are released in the first two months of 2013. Hurray! 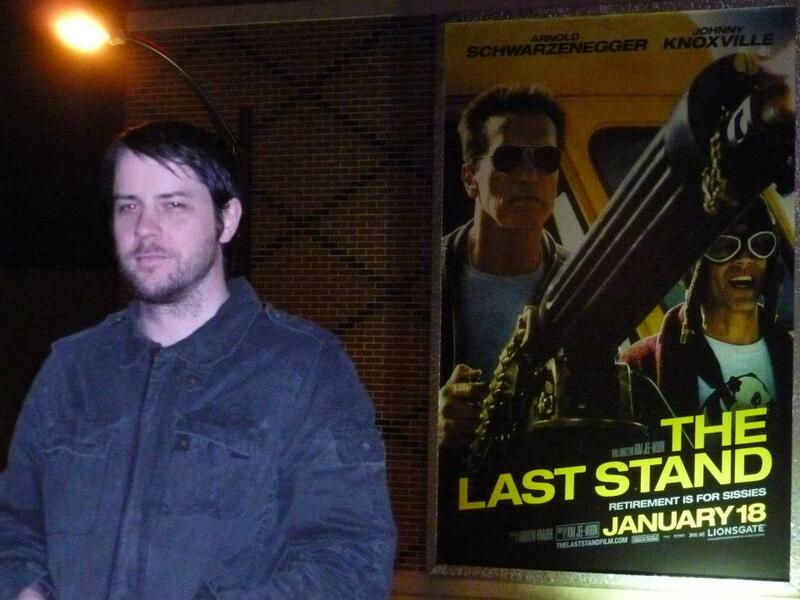 To say the least I was really excited to see THE LAST STAND. I even got my picture with the poster. Look at how happy I am. That's probably the biggest smile you are going to get out of me. That poster was across the street by the way. It was huge. I am standing on the second floor of a parking garage. Reviews for it were good, but it didn't do well at the box office. I was going to go but just got busy. Still might catch it this week though! Some actors, like Arnold and Connery, just get better with age.